An old and respected camera brand enters the 4K action camera market. Rollei's Actioncam 420 offers a host of headline-hitting features including 4K and slow motion video, Wi-Fi connectivity and a striking large rear LCD. Initial impressions are good, but different video resolutions and frame rates reveal a very different outcome, with high contrast, pixelated footage and a too-basic app. This is a camera with so much missed potential. Rollei's Actioncam 402 is in essence an oversized GoPro with the familiar box design encased in a waterproof housing. Making sure the 420 stands out in a crowded market, Rollei offers the camera in three colours: black, blue or white. It is also one of the only budget cameras to offer a flat lens on the housing with no screws or indents, which means that it's easy to clean and instantly wins affection. 4K is the big headline feature and this is joined by plenty of other resolutions and frame rates, including full HD at 60fps and 720p at 120fps; perfect for capturing slow motion footage. The front of the camera features a small f/2.5 lens with a 170-degree field of view. The 420 also offers a variety of modes alongside video. including Photo, time-lapse, slow motion, Driving and Motion detection, giving you plenty of options. Wi-Fi is supported by an app for Android and iOS and this is very neat and simple, enabling the usual live view and settings adjustments. The larger size of the 420 also means that it has a decent-sized 2-inch LCD on the back. Powering the camera is a 3.7v 1180mAh battery that supplies enough charge for almost two hours of continual use, though this battery is sealed and is not interchangeable. 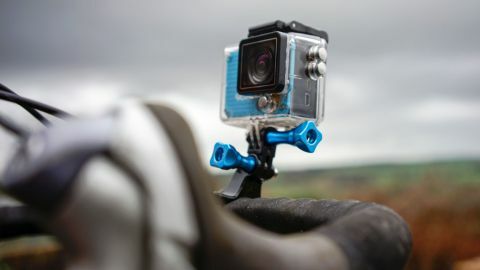 The base also features a very handy standard tripod mount so the camera can easily be removed from the case and mounted on a tripod without the need for additional accessories. The camera is extremely well built with the rubberized exterior giving a really nice finish. All buttons are equally well finished and feature small icons that clearly show the function of each button. Without its case, the Actioncam 420 is a nicely-designed camera with a handy tripod socket in the base. Without the case, the camera is a very nice piece of kit to use, just slightly larger than a GoPro. The exterior features four buttons which are intuitively laid out. Push the shutter button and the camera switches on, you push it again to start recording. On the front is the Wi-Fi activation button, while on the side are the up and down navigation buttons with the shutter button being used to confirm selections. Below these two buttons are the USB 2 type B and HDMI micro connectors. Once the camera is connected to a mobile device, the app also enables the adjustment of settings, yet it only allows a relatively limited number of adjustments compared with the direct in camera options. When using Wi-Fi the camera defaults to 1080p with a choice of either 60, 30 or 25fps; when the app is in use there is no access to any other resolutions or frame rates. As this comparison shows, though, the Rollei is larger than the GoPro Hero4, and this does make it easier to knock accidentally. The camera is designed to sit within the supplied waterproof housing and this features a nice flat, easy-clean lens, a GoPro style mount on the base and a lever lock door to make sure the housing stays sealed. This style of lock is a little dated and can be fiddly to open and close and the secondary lock can become jammed in muddy conditions The case offers a good level of protection and has a 40m waterproof rating. In use the housing provided excellent protection for the camera, and the flat lens was ideal for the muddy testing conditions. The only issue was that of the small secondary lock on the lever. After a few hours in the mud this became well and truly jammed, and required a good wash under a tap to enable it to be released.